All vendors who are members of the Cletrac discussion forum must clearly state in the signature of your posts that you are a Vendor and the firm you are representing. If you need help with this, please let me know. New Vendor Participation: Vendor input and commentary is welcomed in our Discussion Forums, however, direct solicitation is not. Vendors have proven to provide insightful conversation and commentary. Demonstrate professionalism in all posts to the Cletrac Discussion Forums. The Cletrac Discussion Forums are not an appropriate forum for emotionally charged discussion between manufacturers, distributors, dealers, shops and/or users. These forums are intended to be technical resources for members interested in learning more about the proper care and maintenance of their tractors. All Vendors will refrain from making direct, emotionally charged, posts to and/or about competitors. All Vendor posts must be civil and technically oriented. If Vendors wish to compare products with competitors, use generic references. 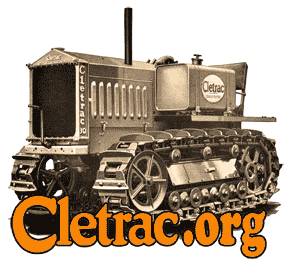 No direct solicitation pricing discussions are allowed on the Cletrac Discussion Forums. The discussion of prices is best left off-line in a private e-mail to those with interest. Why? Because many people who visit our Website do not want to read solicitations and sales pitches in our Discussion Forums. To promote their business, it is recommended that Vendors purchase a reasonably-priced display or business card ad on our Website. Free Classified Advertising is for use by individuals and not commercial Vendors. Vendor participants must have their business name incorporated into their signature block. Vendors may include their business telephone number within their Profile (but not in their signature) so that it is available to other Cletrac.org website users. Please join in with us, lend your expertise, and have fun!